In Lectures 4 through 6 of his Lectures on the Establishment and Extension of National Churches, Chalmers treats some related and pertinent issues. We will continue our survey of these lectures here and close in the final installment with some observations on the whole. Lecture 4, treating the circumstances that lead up to and justify the state’s selection of a Christian denomination for the instruction of its people in matters of faith and morals, begins with the observation of an ideal. It is ideal when leaders and those who are led are at one and not locked in a struggle of wills, the one against the other. It is ideal when they find themselves in complete harmony and sharing a unity of sentiment. When this actually occurs, we observe “community in its best and happiest mood – when one simultaneous feeling pervades all classes; and, in the pulsations of one mighty heart, the breath of one actuating and reigning spirit, the wealth and efforts of all are consecrated to one common object, and all jealousies are forgotten” (115). Religion has oftentimes been the banner under which governments and the governed have rallied, when the legal and the voluntary principles fused together and acted as one in spiritual concerns. This occurred, of course, in the days of the godly kings of the Old Testament. But ought religion be the rallying point for national unity between the state and its subjects today in the Christian epoch? The New Testament seems to be quite silent on the matter. So to answer this question, Chalmers turns to the two great instances where this occurred in the Christian era – the first, under Constantine, and the second, at the Protestant Reformation. By examining the circumstances leading up to these establishments of a state Church, it is suggested that the justifications for them will readily appear. In the first instance, by the time of the Edict of Milan in 313 A.D., Christianity had significantly leavened the Roman Empire. 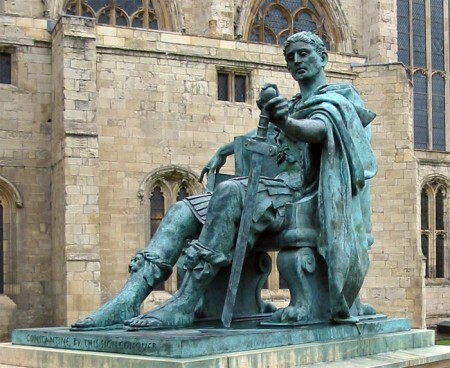 Constantine’s adoption of Christianity as the state religion was by no means an act of coercion; it had very much become a popular religion. Whatever his motivation for the Edict and his later patronage of the Church – a subject that has continually been disputed – he enshrined this obscure, oriental faith as Rome’s own, without general dissent. The government and the governed had happily come together under the aegis of Christ. Further, it should be noted that the Church did not demur at the offer of patronage. She gladly accepted this as nothing other than a clear blessing from heaven. To justify this action biblically, Chalmers observes, “We read of the earth helping the woman. But we nowhere read, that it is the duty of the woman to refuse this help, or to refrain from the facilities which are opened up to her by the hand of Providence, for the multiplication of her converts” (119). In the second instance, both people and governments of the Reformation came together around the doctrines of the Gospel as it began to enjoy renewed success after ages of obscurity. And this expressed itself structurally much in the same way as it had under Constantine. The Reformed Church was owned and endowed in nations across Europe, to the rejoicing of all (except within the Vatican!). This great question, whether the state may join the popular sentiment of the people in matters of religion, was before the Parliament of England at the time of the publication of these lectures. Their decision was first a decision of moral and theological consequence; and second, it was one that had ramifications on the outward, economic well being of the people. It was imperative that these considerations be weighed, says Chalmers, when the cry is not for the joining of the people and the rulers around the Gospel, but for their separation. But can or should the government really enter into the theological disputes of churchmen? “We are aware of the summary and contemptuous rejection to which this proposition is liable – as it would transform the senate-house into an arena of theological conflict . . . and senators into wrangling polemics” (125). This is an exaggeration, says Chalmers. The greatest questions on the matter of religion are well within the capability and are rightly in the purview of the government. A decently educated man in office, with filial respect for sacred scripture, can and ought to decide between the merits of Roman Catholicism and Protestantism. He can consequently select one of these two rival faiths for the doctrine to be taught to his people. But even if the exaggerated objection is granted, Chalmers contends that one should be able to select one of these two on purely economic grounds. There is more than enough evidence, he contends, to select Protestantism as that expression of the Christian faith that best tends to the improvement of the outward conditions of a people. And conversely, “all history and experience tell” us that Romanism is of all religions “most fitted to blind and vitiate a population” (132). Chalmers concludes the lecture by turning to the then contemporary question of the Protestant Establishment of Ireland, appealing for its continued subsidy, then apparently under threat in Parliament. He freely acknowledges that in prior days, it had been filled with less than perfectly diligent laborers and so had warranted some criticism. Interestingly, he critiques many of the ministers of that establishment for having failed to evangelize Roman Catholics within their parishes. But over and above this, there was a mistaken policy, maintained and avowed even by their best clergymen, in the form of an honest, though still of a grievously mistaken principle – as if they went beyond their legitimate province if they at all meddled with the Catholic population; at which rate the primitive Christians went beyond their legitimate province, when they meddled with the Pagans of the Roman empire. . . In virtue of this false principle, or false delicacy, the cause of truth suffered, even in the hands of conscientious ministers (135). The parish plan is an efficient one for the extension of the Gospel. But boundary lines were made for man, not man for the boundary lines! To continue, the failures of the operators, however, ought not to warrant the dispensing of the machine. And its patronage should continue, especially in light of the renewed and revived ministry that had emerged in his day, who stood in need of the support of the state. If however, the powers that be decided to pull the financial plug, that Church would have to toil valiantly as her unendowed predecessors had in the pre-Constantine era. The hand of power may strip it of its temporalities; but we trust that its indomitable spirit in the cause of a pure and scriptural faith, will not so easily be quelled. Though despoiled of their rights, they will not abandon their duties. Like the Christians before the days of Constantine, they may perhaps have to win the ground over again – when the Church, purified by the discipline of adversity, will again arise in its strength; and repeating the conquest of truth over the errors of a degrading superstition, will add another victory to the triumphs of former generations (137). This however is no argument, he contends, that statesmen ought to do evil that good may come. Those deliberating on the matter should be very careful, further, not to give over too soon to the vacillating impulses of the shortsighted masses. Let the fathers have the foresight to provide for their children what is best. In the sixth lecture, Chalmers turns to the consideration of a previously untreated dimension of a religious establishment. We observed in the opening lecture what an establishment is in essence: it is a sure, legal provision for the Christian education of a nation. But there is a distinction to be made. An establishment can be endowed, but not territorial. While an establishment may exist without a territorial plan, it is inefficient until it adopts and enacts one. An establishment is a very helpful stepping stone to what Chalmers was really after – a mechanism for the effective Christianization of a nation. To perfect this arrangement, [such subsidized, territorial ministers] must stand so related to his church, as to have a right of preference over all extra-parochial families to the occupation of its sittings; and he, on the other hand, should be so related to his parish, as, if not to have a right of entry into all the houses, at least to be bound in point of duty to make a tender to every householder who is willing to receive him, of such ecclesiastical attentions and services as his time will permit to him bestow, and which might be conducive to the Christian good of himself and of his family. In other words, he is bound to superadd, as far as the people will let him, week-day and household to his Sabbath-day and pulpit ministrations. He is the minister not of a congregation only, as far the greater number of our unendowed ministers are; but he is the minister both of a congregation and of a parish (143-44, emphasis mine). This distinction is key. ‘Church’ and ‘parish’ are not equivalents for Chalmers. They are concentric circles, the one inside the other, but quite distinct from each other. A territorial minister is not just a parish minister (evangelist), nor is he just a congregational minister (pastor). He is both – a pastor-evangelist, if you will – with distinct responsibilities to both circles. To illustrate it, he instances two religious establishments that were legally endowed but did not operate on a territorial plan – the Protestant Establishment of Ireland and the establishments active during the American colonial era. Ministers and churches were state-funded, but there was no defined, territorial evangelistic responsibility for anyone in particular. These men served their own congregations, but were not obliged to go after any particular group in the surrounding area. Such a minister, says Chalmers, “has to do with his hearers [those who voluntarily, of their own impulse, come to church]; but there is nothing in such an economy, which at all necessitates him to do with those who are not his hearers. They may choose to attend him if they like; but if they do not choose, they may accumulate in any numbers without the sphere of his observation . . . If they do not come to him, there is nothing in this congregational, even though endowed system, which insures that he should go to them” (145). Territorialism is the great strength of an establishment. In Chalmers’ thinking, establishments are only valuable as means by which territorialism can be most efficiently established and operated. And it is territorialism alone by which “we can recover a people from the moral degeneracy into which they have fallen” (146). To argue the virtues of the territorial plan, he suggests an experiment. He challenges anyone to go through some poor city neighborhood, including not more than 2000 souls, and perform a house-to-house survey. How many live there? How many regularly attend church? The result, he is confident from past experience, will be quite surprising. Let the voluntary or the free trade principles reign, and human nature that does not ‘seek after God’ will show itself. Few will be found church-attenders. Even if a Voluntary chapel were placed within the vicinity, few if any of the people in that neighborhood would come. Yes, you might have others “from all distances” beyond the area attending, all with “a predisposition for the services of the sanctuary, and a power as well as a willingness to pay for them” (149). But what of the lost next door? Will they come if they are not sought? Now the specific business which we would like to put into the hands of a Christian minister is, not that he should fill his church any how – that he may do by the superior attractiveness of his preaching, at the expense of previous congregations, and without any movement in advance on the practical heathenism of the community: But what we want is, to place his church in the middle of such a territory as we have now specified and to lay upon him a task, for the accomplishment of which we should allow him to the labour and preference of a whole lifetime; not to fill his church any how, but to fill this church out of that district. We should give him the charge over head, of one and all of its families; and tell him, that, instead of seeking hearers from without, he should so shape and regulate his movements, that, as far as possible, his church-room might all be taken up by hearers from within. It is this peculiar relation between his church, and its contiguous households, all placed within certain geographical limits, that distinguishes him from the others as a territorial minister (151). But how, practically speaking, would this territorial plan be carried out within the proposed neighborhood? He suggests picking a neighborhood with the lowest likely church attendance – in his days, some slum of one of the sprawling industrial cities of the United Kingdom – and let the minister frequently visit the people throughout the week over the space of many years. The result should be a gradually increasing attendance of the people in that district of the stated services of worship in the church. One might object, however, that this proposal seems too idealistic, too romantic. But Chalmers rejoins that experience has shown that ministers who have acted on the territorial principle, visiting the people ‘from house to house’ over a period of time, have discovered only reciprocal warmth and respect. And it is only natural for such a response when men are visited by a truly genuine, caring individual who has taken a concern for their spiritual, physical, moral, and economic well being. Sincere benevolence is naturally drawing. And so he assures his readers that if such an honest Christian philanthropist will but “go forth on such a territory as we have ventured to chalk out for him; and more especially, if he reside within or upon its confines – there is not a month will elapse, before that by his presence and his labours, he will light a moral sunshine throughout nearly all the habitations” (160). The most reckless, the most resolute in their moral hardihood, are not beyond the operation of these. Even let them carry it so far, as to barricade their houses, even as their hearts are barricaded, against the first approaches of this apostolic clergyman; and he need not yet give them up in despair. He has only to watch his opportunity and Providence will work for him. The hand of death may at length open a door for him – even to the worst habitation of aliens in the parish. Let him be ever ready with his services; and, in the house of family disaster or family bereavement, the most sullen and else impracticable of these outlaws from all the decencies and humanities whether of Christian or civilized life, may at last give way (168). In due season we shall reap, if we faint not! And of course, all of this is of no avail if unspiritual men are set to operate this territorial establishment. Hirelings will only squander the subsidies and leave the territory uncultivated. But these real facts should not dissuade us from eschewing the “random economy” and embracing the endowed, territorial plan as the most expedient way for the seeking and saving of the lost. The last lecture turns to the thorny question as to how a government can justify the selection of one particular denomination of Christianity for its religious establishment, to the exclusion of others equally legitimate. The very simple answer is that the alternative is highly impractical. The government “will not find it so convenient, if, attempting to be even-handed with all sects, and at the same time to provide a Christian education for all the people, it shall make the further attempt of arranging” the assortment of evangelical denominations “into parishes” (171). There is a twofold problem here. First, the people “cannot thus be made over, at the arbitrary will either of civil or ecclesiastical superiors … in sections of contiguous households, to this one or that other denomination, just according to the locality in which they happen to reside” (171-72). Second, the government cannot effectively provide Christian education to its people without “the medium of one correspondence, and . . . the simplicity of one management” (174). So on what principle shall the selection be made? We have already seen that statesmen, if they are thoughtful Christians, should be able to decide in favor of Protestantism. But of which variety? And how shall this choice be made without eliciting the outcry of injustice to those left standing in the rain? Chalmers reminds statesmen that they ought not retreat from their duty, the provision of a Christian education for their people, because of the complexities and even the delicacies involved. Someone will complain; someone will be offended. But “the moral well being of the nation is not to stand at abeyance, till an adjustment shall have been made among controversies not yet determined, and perhaps interminable” (178). Government, further, in choosing one denomination over another for the religious establishment, should not fear accusations of favoritism. She contracts with one that suits her for the greater good envisaged, the national good, and with a clear conscience leaves the others to their own business. Turning from defense to offence, Chalmers asks the objectors whether or not the minor differences that separate them should hinder the upholding of a common faith and a common cause, the spiritual well being of mankind? And if the objectors outside the establishment demand to know why they are kept out for such minor differences, he retorts that they should answer as to why they stay out for such minor differences? Then with a frank bluntness, he observes that it is only “through the very wantonness of freedom in this land of perfect toleration” that men “have chosen to besport themselves, and so [have] broken forth into their party-coloured varieties; each having a creed, or rather, I would say (for substantially speaking nine-tenths of the people in Britain have all the same creed), each having a costume and a designation of their own” (182-83). To close, Chalmers calls for unity. Not unity for unity’s sake, however; unity for the sake of the cause! It is our conviction, he writes, that “only by an undivided church, only by the ministers of one denomination, can a community be out and out pervaded, or a territory be filled up and thoroughly overtaken with the lessons of the gospel. Tell, whether it is of greater consequence that minor differences be upholden, or that the universal Christian education of our families shall be provided for? But, in truth, these minor differences may co-exist with the operations of an effective establishment” (188).